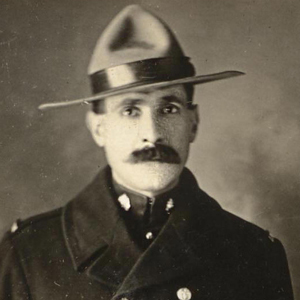 Frank joined the Force on September 4, 1914 and volunteered for the Cavalry Draft RNWMP in May 1918 and was later deployed to “A” Squadron RNWMP which saw service in France and Belgium. After returning to Canada, he was posted to “F” Division and later to “E” Division. While in “E” Division, he would serve as the only member stationed at Cloverdale (municipality of Surrey) BC and was doing federal enforcement duties along the Canada-US border. In September 1939, he retired from the Force and secured a job as a local bus driver. Frank died on January 21, 1965 and was buried at the Sunnyside Cemetery Surrey, B.C. 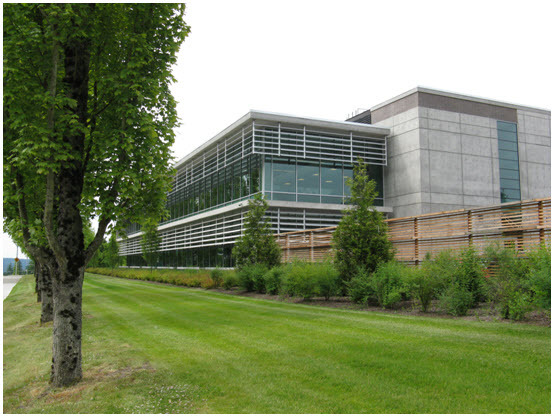 In recognition of being one of the first RCMP members stationed at Surrey, the new annex to Surrey Detachment was dedicated to him on December 2, 2010. Ric has provided below some photographs which the Pearson family has shared with Surrey Detachment. 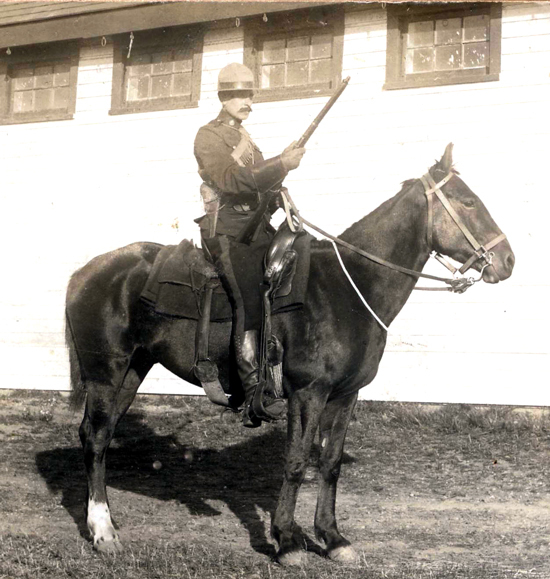 1914 – Photograph of Constable Frank Pearson at “Depot” barracks in Regina (Source of photo – Ric Hall’s Photo Collection). 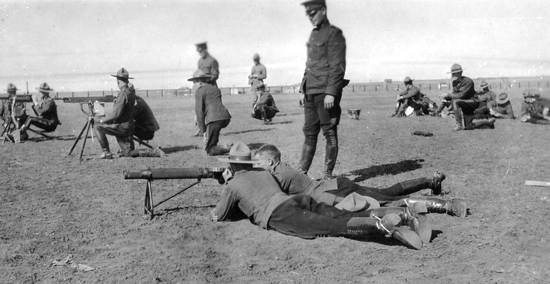 Photograph of RNWMP members on the “Depot” barrack range receiving instruction on machine guns (Source of photo – Ric Hall’s Photo Collection). Photograph of RNWMP members resting while on patrol. 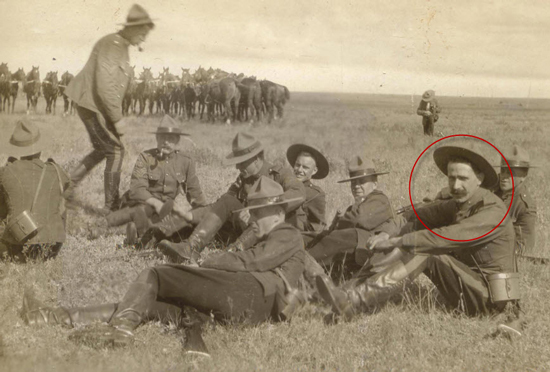 Frank Pearson is identified with a red circle (Source of photo – Ric Hall’s Photo Collection). 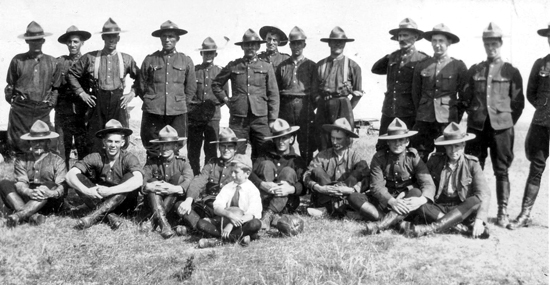 1918 – Photograph of “A” Squadron RNWMP members at Camp Shorncliffe England (Source of photo – Ric Hall’s Photo Collection). 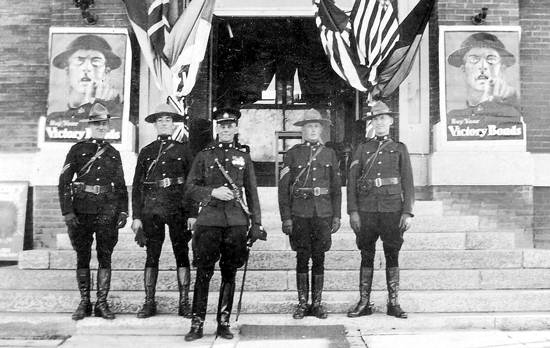 Photograph of RNWMP members standing outside a World War I Recruiting Station (Source of photo – Ric Hall’s Photo Collection). 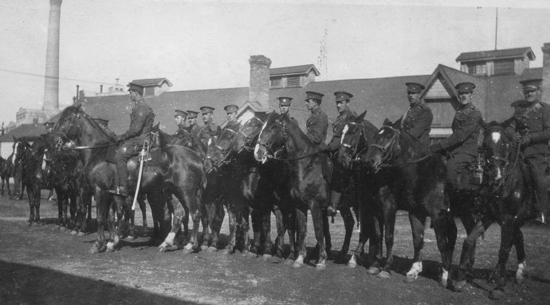 Photograph of RNWMP members (Source of photo – Ric Hall’s Photo Collection). 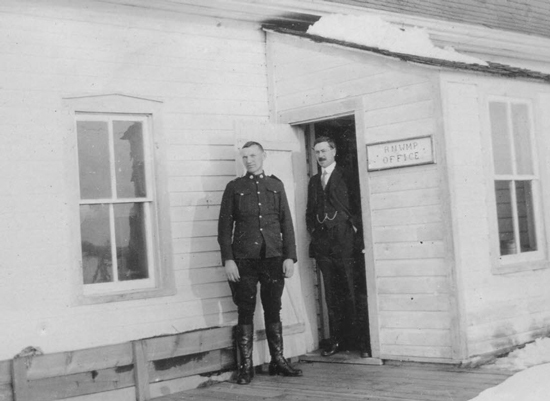 Photograph of RNWMP members standing outside their office (Source of photo – Ric Hall’s Photo Collection). 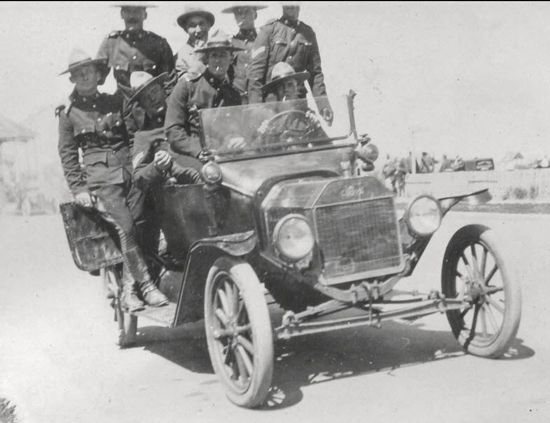 Photograph of RNWMP members trying out the new Ford horseless carriage (Source of photo – Ric Hall’s Photo Collection). 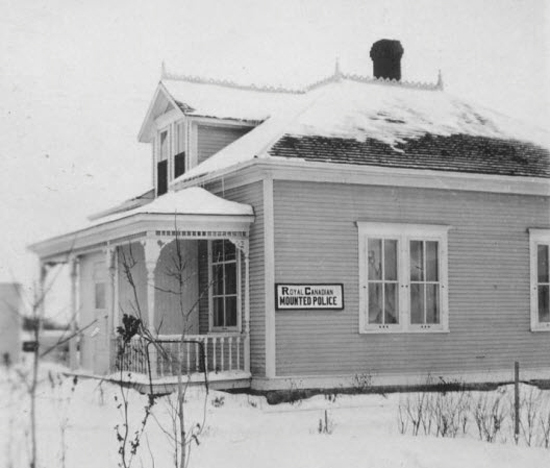 Photograph of an RCMP Office (Source of photo – Ric Hall’s Photo Collection). Photograph of Sgt. Frank Pearson (Source of photo – Ric Hall’s Photo Collection). The following is a photograph of the new building annex at Surrey Detachment which was dedicated to Sergeant Frank Pearson by Surrey Mayor Diane Watts. 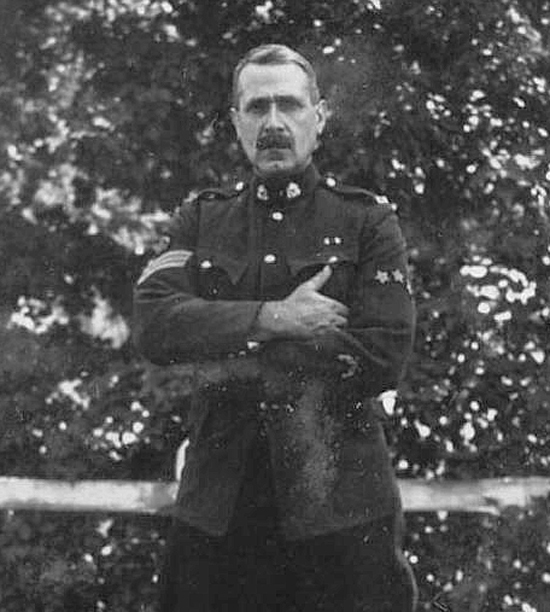 Photograph of the Sgt. Frank Pearson bulding annex at Surrey Detachment (Source of photo – Ric Hall’s Photo Collection). If you have old Force photographs that you would like to have included in one of Ric’s forthcoming Photo Corner webpages, please email him at rshall69@telus.net He will scan the photographs and return the originals to you.